PROACT offers a variety of treatment avenues including both abstinence-based services as well as Medication Assisted Treatment. At PROACT, treatment begins on day one with a clinician who will conduct a comprehensive, structured clinical assessment to inform a diagnosis, a recommended plan of care, and to identify social or personal needs requiring further referral. Individuals entering our service are given timely access to a physician as well as to all other services offered by our program. Housed in an outpatient medical facility, PROACT serves as a single, regional referral point to assess patients following discharge from local emergency rooms and inpatient detox units and by referral from our quick response teams and other emergency medical response teams. 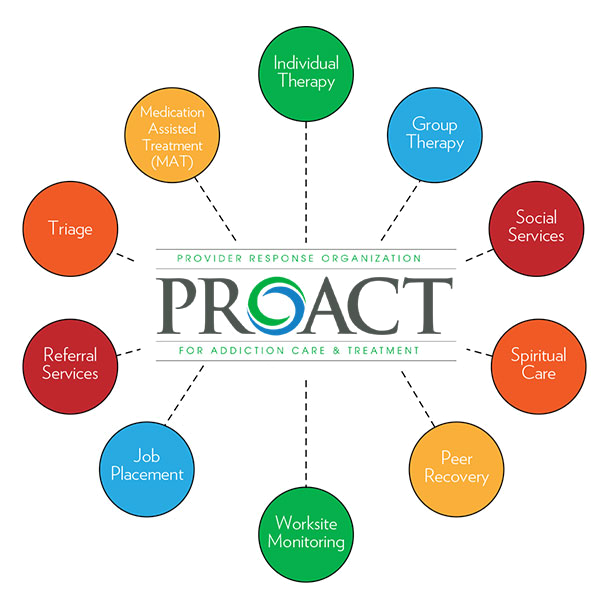 PROACT also accepts self-referrals and referrals from community providers. First and foremost, the PROACT model is about the individual—recognizing that recovery looks different for each person. The ultimate goal of PROACT is to effectively serve, educate and treat every individual through and beyond the initial stages of recovery until they become long-term, committed members of society.